I usually stick to my planned weekly posts to celebrate children's authors on their birthday. But, today I am introducing a new feature that is different, random, and fun! It is called Surprise Party. A Surprise Party post will introduce you to a newly published author and highlight their book. I hope you enjoy the feature and meeting the authors. 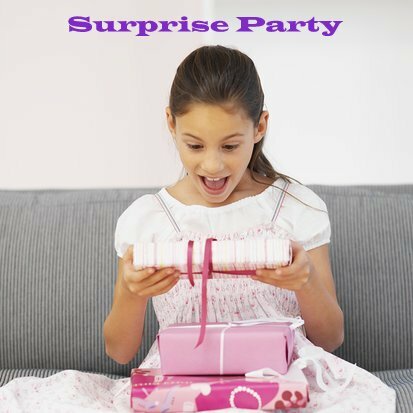 In this "Surprise Party" post there will be an author interview, poetry lesson plan ideas, and a book giveaway. April is National Poetry Month and many schools and libraries have had their celebrations. We have one more celebration to sneak in before the end of the month as we celebrate Tom and Tess Hannah. 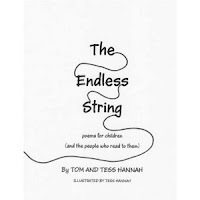 They are the authors of The Endless String: Poems for Children and the People Who Read to Them . The poems in this book are really funny, rhythmic and have great rhymes. There are over 60 poems and many are illustrated with simple black line art by Tess Hannah. I enjoyed many poems including one about giraffes eating bagels at the grocery store and another about a scientist named Silas McGrew with a lofty IQ. I read many of the poems to my daughter who is almost 5 years old and many of the poems would be appreciated by children up to the age of twelve. We typically do not read many poetry books in our house. However, my daughter has been on a poetry kick ever since reading many of the poems from The Endless String! She has been finding all of her poetry books in the house including some from Jack Prelutsky and Shel Silverstein. This paperback book is available for purchase on Amazon.com for only $9.95! I hope you check it out and support these new authors. I asked Tom and Tess a few questions about writing the book, reading to their children, and of course birthdays! Happy Birthday Author: What was your motivation to write a book of poetry for children? Tom and Tess Hannah: Our motivation for writing a poetry book for children came from our own children. There were so many humorous events occuring all around us on a daily basis, that we just felt the need to record them in an entertaining way. Happy Birthday Author: Where do your ideas for poems come from? Tom and Tess Hannah: The ideas that gave birth to some of the individual poems actually came from our own childhood memories (cleaning out closets, eating vegetables, etc.) and from our experiences while parenting four children. Happy Birthday Author: What is your favorite poem in the book? Tom Hannah: My favorite poem is "What's in Your Closet? ", because it was a constant theme at my house during my growing-up years. I eventually lost the battle and my mother threw out all of my "good stuff". Tess Hannah: My favorite poem is "I'm Stuck on You" (a poem about stuff getting stuck to your shoe), because it was the most fun to write. It gave me a vehicle for being as wacky as possible. Happy Birthday Author: How do you think poetry can be used in the home? Tom and Tess Hannah: Poetry has so many features that make it "user friendly". Our own children loved reading poetry books at home because they were so easy to pick up, read a bit, and put down, without being committed to a chapter book. Our children all had their favorite poets and poems. Happy Birthday Author: What routines of reading did you have for your children as they were growing up? Tom and Tess Hannah: Like many parents, our bedtime routine always included a story or two after the little ones were tucked into bed. We also read frequently ourselves because we felt that it was important to model that behavior. During the school year we always had a "no TV night" each week when the whole family would follow academic pursuits, which meant reading after homework was finished. Reading during summer vacation was also important to us. Happy Birthday Author: What are your future plans as authors? Tom and Tess Hannah: As far as plans for another book, we have a number of poems already started, and one longer poem that could be a children's picture book as well. Happy Birthday Author: We are all about books and birthdays here. When are your birthdays? Happy Birthday Author: Do you have a favorite birthday memory or tradition? Tess Hannah: My favorite birthday tradition is using our "You are Special" red plate to celebrate the birthday person's big day. Tom Hannah: My birthday falls on the same day as my grandfather. There was always an extra special celebration at their house for his birthday. On my 16th birthday, I received my grandfather's watch that he used on the railroad. Now many years later whenever I wind the watch, I think of him. Tess Hannah: When I'm trying to inspire my 6th grade students to find their "inner poets, I tell them that poetry is like words to a song. They are just words on a page until you HEAR them. Poems are meant to be read aloud in order to enjoy the music of poetry. Tom and Tess Hannah have generously provided copy of The Endless String as a giveaway to one lucky reader of Happy Birthday Author. Post a comment to this article to qualify for the drawing. To receive an extra entry mention how you shared the information about The Endless String by Tom and Tess Hannah (Twitter, Facebook, Word of Mouth, etc.) Deadline for entry is May 7, 2010. Make sure you leave email contact information. Disclaimer: I was not compensated for this post. However, I did receive a book to aid me in producing the post. The blog does receive a small percentage for Amazon.com purchases. Sounds like a wonderful book that my kiddos would enjoy! What fun! I love reading poetry with my kids. I'd love to share this book with them! I would love to give this book to my grandchildren! I know they would enjoy it! Great interview! Tom and Tess's book is a good one! My kids really enjoyed reading their poetry! Great going with the promoting! Lovely blog article from eris! How cool to have your birthday on the same day as your grandfather. This was a great interview especially perfect for the ending of National Poetry Month. I would love to win this for my wonderful sister! Thanks for the chance! Oh boy! A new poetry book and it sounds like such fun. Can't wait to read it. I love reading poetry to kids. My son is dyslexic and loves to read poetry. Great book for my younger cousin! A very good interview! AND we're on a poetry kick in our house right now! I took my bebes to a Poetry Slam last week, and both of them are loving it! Got home, pulled out some books and we've been reading them to each other. Today, bought another copy (I don't know what happened to my first) of "Where the Sidewalk Ends" ... we run in themes in our house and this book looks like it will fit right in to the current theme! I love using poetry with my kinder kids! Thanks to everyone for entering this contest!